The praying mantis is named for its prominent front legs, which are bent and held together at an angle that suggests the position of prayer. The larger group of these insects is more properly called the praying mantids. 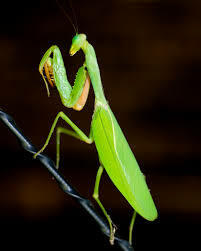 Mantis refers to the genus mantis, to which only some praying mantids belong. Anatomy: The praying mantid's common name comes from its at-rest stance, with its forelegs folded up, as if praying. These insects are masters of camouflage, using their coloration to blend in with foliage, allowing them to hide from predators and to better stalk their prey. They are adapted to not only blend in with the foliage, but to mimic it, sometimes looking like leaves, grass, or stones. Praying mantids can range from one to ten inches in size, have large heads, small grasshopper-like mandibles, and large leg segments with their middle and hind legs being thinner and their front legs containing spines that they use to capture their prey. They can only move the top part of their bodies, which enables them to approach their prey without startling it. Praying mantids have great eyesight and catch their prey with their powerful forelegs, hold it in place, and devour it using their strong jaws. Their antennae are short compared with the rest of their bodies and they have long narrow wings that are folded in a fan-like way over their abdomen. Mantids are hemi-metabolic, meaning they undergo simple metamorphosis that includes only the egg, nymph, and adult stages, with the nymph being almost identical to the adult but without wings and functioning reproductive organs. Females and males can be identified by the number of abdominal segments they have. Females have six and males have eight. Mantids are also one of the only insects that can turn their heads. Habitat: Praying mantids can be found throughout the world in tropical areas and sunnier areas in temperate zones, including North America and southern Europe. There are many species of mantids, but most are tropical, belonging to the Mantidae family. Diet: As a mantid grows, its diet frequently changes. They will eat insects, such as beetles, butterflies, grasshoppers, and other mantids, spiders, and small vertebrates that include small frogs, lizards, mice, and hummingbirds. Threats: Though their ability to camouflage helps protect them, praying mantids have many predators, including birds and bats. Some mantid species have developed an ability to hear the high-pitched sonar that bats use to navigate in order to be able to avoid these predators. How You Can Help:By providing communities and businesses with economically viable alternatives to forest destruction, the Rainforest Alliance is helping them to ensure the health and survival of wildlife habitats and the plants and animals that depend on them. With your help, we can reach a tipping point in favor of forests and the people and wildlife that depend on them.